eAnalytics is a web application built on top of R that provides dynamic data analytics to energy industry stakeholders. The application allows users to dynamically manipulate chart data and style through the Shiny package’s reactive framework. eAnalytics currently supports a number of features including interactive datatables, dynamic charting capabilities, and the ability to save, download, or export information for further use. Going forward, the goal for this project is that it will serve as a research hub for discovering new relationships in the data. The application is illustrated with a simple tutorial of the user interface design. Energy companies are interested in creating statistical models in order to benchmark performance . Past work has often resulted in proprietary models (see, for example, Fisher et al,  and Lee et al. ). Fortunately (or unfortunately depending on one’s perspective), the energy industry happens to be one of the most heavily regulated industries in the US, with much of the data that is collected by agencies being freely available online. The problem, however, is that the data is extremely difficult to find and understand. As a result, this potentially powerful source of information is at best underused, and at worst undiscovered. 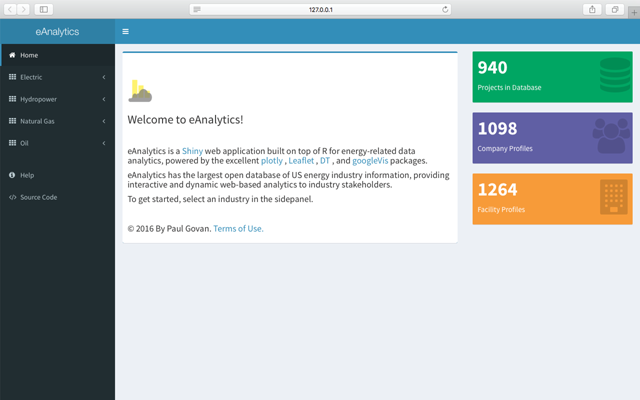 eAnalytics is a free and open-source data analytics web application for energy industry stakeholders. The main motivation for developing eAnalytics was to gather and publish this information in order to spur interest in the research community. The secondary goal of this project was to provide a working example of how federal agencies could improve their database management systems. 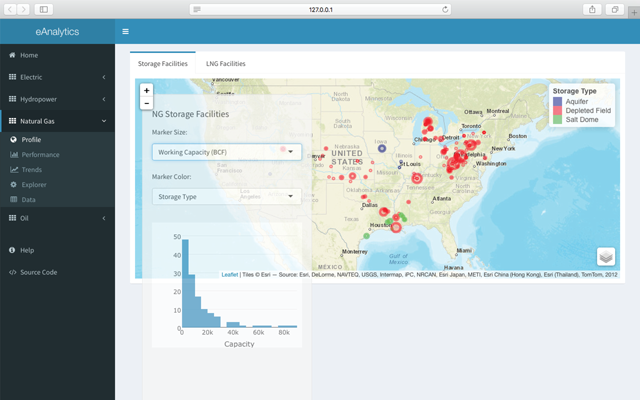 To the best of the author’s knowledge, eAnalytics has the largest free and open-source database of US energy project information. The application’s current features include allowing users to explore the data in greater detail, take an overview of different industry segments, measure key performance indicators (KPIs), and identify changes in the industry over time. Going forward, the goal for this project is that it will serve as a research hub for discovering new relationships in the data. 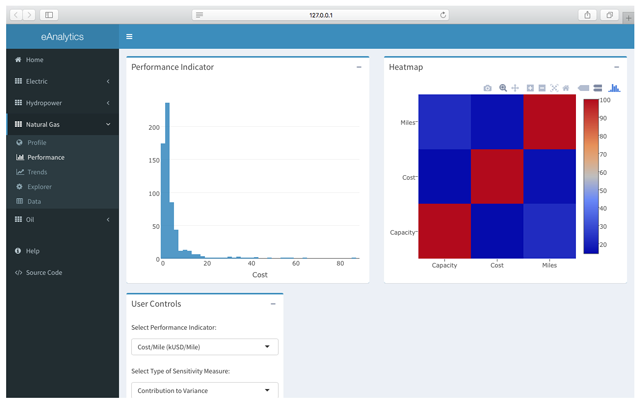 eAnalytics is built using the Shiny  framework for developing web applications in R. The structure of a Shiny app consists of two primary components: (1) a user-interface script that controls the layout and appearance of the app and (2) a server script that contains instructions for the computer to build the app. The Shiny package contains multiple layout templates or the ability to build the user-interface from html content. eAnalytics is designed using the shinydashboard  package, which is a theme on top of Shiny for creating dashboard pages. The application is organized into a number of dashboard tabs based on the current features, which are discussed in the following section. These features are illustrated in more detail in the following examples. Launching the app first brings up the Home tab, which is basically a landing page that gives a brief introduction to the app and includes three value boxes for the current number of projects, companies, and facilities in the database. Figure 1 shows the Home tab as of this writing. The Profile tab contains a number of interactive maps with information about facilities for the selected industry. Figure 2 shows the Profile tab for the Natural Gas Industry. Profile Tab for Natural Gas Industry. Multiple options are currently available for customizing the maps. Choose a preferred size or color variable in the movable well panel, select from different basemaps via the lower-right control, and click on a specific facility to view additional information. The Performance tab tracks a number of Key Performance Indicators (KPIs) for the selected industry. Figure 3 shows the Performance tab for the Natural Gas Industry. Performance Tab for Natural Gas Industry. The Trends tab contains multiple interactive time-series charts of financial information for the selected industry. Figure 4 shows the Performance tab for the Electric industry. Trends Tab for the Electric Industry. The time-series chart in the Trends tab is linked to the data table shown in the Data tab (see Figure 6). Searching, filtering, and sorting the data in the data table will automatically update the time-series chart with the selected data. Explorer Tab for Natural Gas Industry. Data Tab for Hydropower Industry. 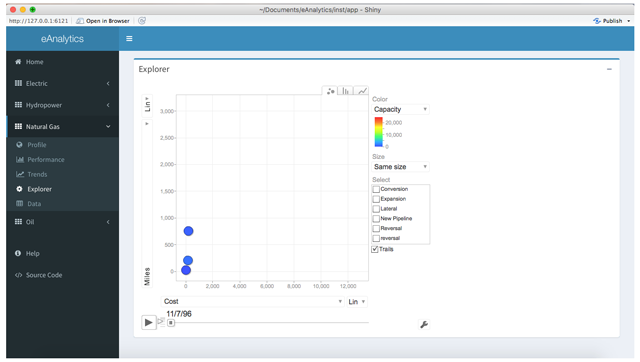 The Explorer tab contains a dynamic motion chart for exploring several indicators over time. 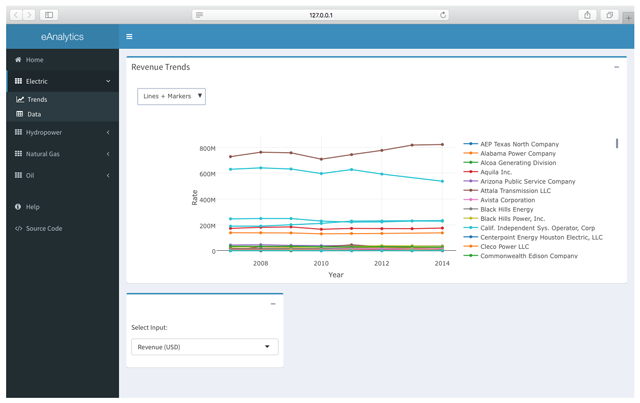 Figure 5 shows the Explorer tab for the Natural Gas Industry. The Data tab contains interactive datatables of information for the selected industry. The data can be searched, filtered, and sorted as required. The selected data can then be copied to the clipboard, downloaded to a csv or pdf file, or sent to a local printer. 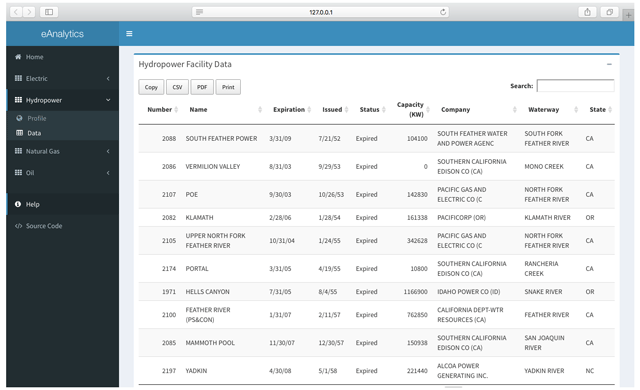 Figure 6 shows the Data tab for the Hydropower industry. eAnalytics has been tested in modern web browsers, including Google Chrome, Safari, Firefox, and IE10+. The application is available on the Comprehensive R Archive Network (CRAN) as an R package at https://cran.r-project.org/web/packages/eAnalytics/. Full documentation and working examples are available at. Issues or requests may be filed at https://github.com/paulgovan/eAnalytics/Issues. eAnalytics a platform-independent software package, compatible with modern web browsers (IE 10+, Google Chrome, Firefox, Safari, etc.). eAnalytics imports a number of R packages: plotly, dplyr, DT, energyr, googleVis, leaflet, shiny, shinydashboard. This project began at a mid-sized energy company that was looking for a way to model and benchmark project performance. The simple idea was that this information was undervalued and that the company could gain a strategic advantage by identifying areas of improvement and potential paths to growth. The result was a simple and adaptable tool that was easy to update and maintain. Now that this application is public, it could provide a strategic advantage to other organizations in an otherwise competitive industry. eAnalytics is an open source project, with the goal of spurring growth in the research community of energy infrastructure. Researchers are encouraged to share and adapt the package as required, with the only request being to pay-it-forward by sharing future insights. The information published in this package serves a wide range of industry segments, and is, therefore, applicable to a wide range of scientific enquiries. Generally speaking, this project helps answer basic questions about the state of energy in the US, such as how energy is generated and stored and how it is distributed and managed. These questions are important to a number of fields, from engineering to economics. Govan, P (2016). energyr: Data Published by the United States Federal Energy Regulatory Commission. R package version 0.1.0. https://github.com/paulgovan/energyr. R Core Team (2014). R: A language and environment for statistical computing In: Vienna, Austria: R Foundation for Statistical Computing. URL http://www.R-project.org/. Chang, W, Cheng, J, Allaire, J, Xie, Y and McPherson, J (2015). shiny: Web Application Framework for R. R package version 0.11.1. Chang, W (2015). shinydashboard: Create Dashboards with ‘Shiny’. R package version 0.5.1. Vaidyanathan, R, Cheng, J, Allaire, J, Xie, Y and Russell, K (2014). htmlwidgets: HTML Widgets for R. : 2. R package version 0.3. Sievert, C, Parmer, C, Hocking, T, Chamberlain, S, Ram, K, Corvellec, M and Despouy, P (2016). plotly: Create Interactive Web Graphics via ‘plotly.js’. R package version 3.6.0. https://CRAN.R-project.org/package=plotly. Gesmann, M and de Castillo, D (2011). Using the Google visualisation API with R. The R Journal 3(2): 40–44.